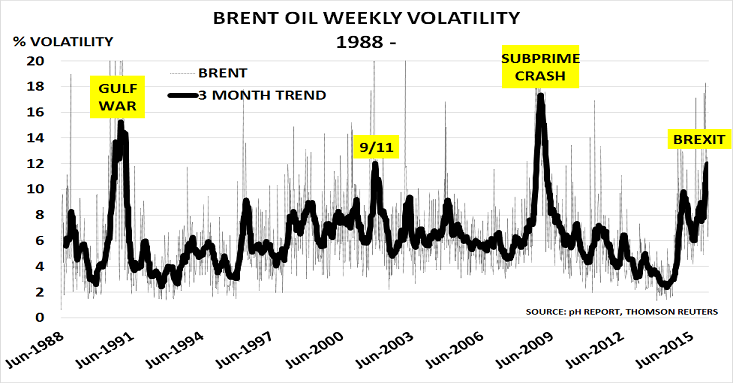 The 3 month trend of Brent oil price volatility has reached its highest level since the 2008 financial crisis and before that, the 1st Gulf War in 1990/91. As the chart shows, it is even higher than after 9/11. “Commercial inventories in the OECD increased from March levels by 14.4 mb to stand at 3 065 mb by end-April, an impressive 222 mb above one year earlier. As the US driving season kicks off, OECD gasoline stocks stand above average levels and last year in absolute and days of forward demand terms. There is a similar picture in China”. The volatility has instead occurred as a result of renewed conflict between the fundamentals of supply and demand, and developments in financial markets. Money managers have piled into the oil futures markets since January, gambling on the arrival of further stimulus from the Bank of Japan and the European Central Bank. They also assumed correctly that the US Federal Reserve and Bank of England would back off the idea of interest rate rises. And, of course, the rally itself has proved counter-productive in terms of oil market rebalancing, as it has enabled US and other producers to hedge forward their production at acceptable margins through H2. The real cause of the rally, and of the increased volatility, has been the US Federal Reserve’s backtracking on its promised 4 interest rate rises during 2016. Once these became doubtful, financial players began to sell the US$ and buy commodities as a supposed “store of value” – a repeat of what happened between 2009 – 2014. Now, of course, the reverse is happening as Brexit worries prompt traders to rush back into the US$ as a “safe haven”. In turn, of course, China’s export drive is reducing margins for other Asian refiners. They were already struggling to find alternate markets for their exports as China becomes more self-sufficient. Now they are also having to compete with China’s own exports in 3rd party markets. The key issue is that the current oil price rally has once again overturned the fundamentals of supply and demand. By thus adding to existing energy surpluses, it has increased the risk of long-term price deflation emerging. Supply has risen far more than demand all along the energy market value chains. It also adds to worries that the fundamental assumptions behind the $3tn of energy market debt – $100/bbl oil and double-digit growth in China – are looking increasingly implausible. When financial markets wake up to this unpleasant fact, even more volatility could result. It could be a very difficult H2 indeed. Greece, Iran, China – suddenly real world issues are starting to dominate the headlines. And few people now believe that printing more money is the way to solve these issues. Instead, political leaders are being forced to take the hard decisions they have ducked for so long. In years to come, money managers will wonder how they managed to become obsessed with guessing games about the behaviour of the central banks, and lose sight of developments in the real world. They will also be amazed at the willingness of many traders to blindly follow the latest trend. And they will be shocked by the way regulators allowed the interests of financial players to dominate the markets they were supposed to serve. But that is all in the future. In the short-term, we all have to manage the challenges created by the Great Unwinding of stimulus policies. The next few weeks are likely to highlight just how difficult a journey this could become.